Hello, this is home page of AJIKI Osamu. Thank you for visiting AstroArts home page. Our WEB site was at 10th anniversary on 1st of March 2005, We'll provide more pleasant and more useful page from now on. Please send me suggestion. 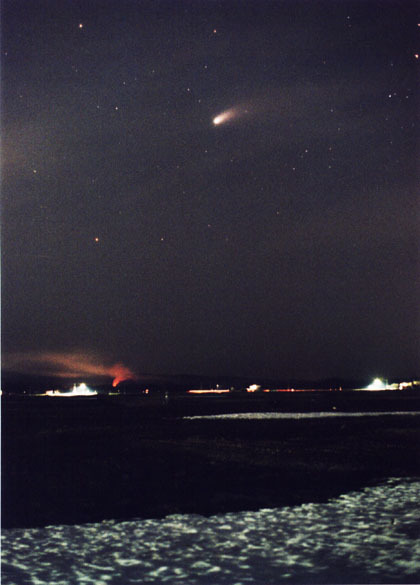 Picture: March 28, 1997 7:35pm JST, Yamagata Pref., Japan. PENTAX-K2(35mm F4) Fuji-Super G800, Exposure 20 sec. Discovered 1995 Jan. 25 by T. Kobayashi at Oizumi. used by astronomers around the world. Ephemeris, XEphem can display starry sky and solar system. Star chart for X Window System. GSC is available. Gtk interface of traditional software "starchart". Graphic display of N-Body problem. Beautiful earth on your root window. I like xphoom, too. Common image processing software for X Window System. Copyright(C) Inc. All rights reserved.